UN Deputy Emergency Relief Coordinator Ursula Mueller meets women in Mopti during her visit to Mali. A senior United Nations relief official has called for greater international attention to the plight of millions in Africa’s Mali, where worsening intercommunal violence and armed group attacks are complicating an already complex humanitarian emergency. UN Deputy Emergency Relief Coordinator, Ursula Mueller – who just wrapped up a four-day mission to Mali – underscored that food, security, protection and peace are of paramount importance. “Violence and intercommunal clashes have gotten worse here this year […] and this has huge implications, including humanitarian organizations not able to access areas and people in need of assistance,” she said, in Mopti (central Mali), where nearly a million people desperately await protection and humanitarian assistance. According to the UN Office for Coordination of Humanitarian Affairs (OCHA), the number of internally displaced persons in Mali has sharply increased since the beginning of the year to over 75,000 by the end of July. In all, some 5.2 million people are estimated to be in dire need of assistance across the country, the number represents one in four Malians. In Mali, Ms. Mueller also met with humanitarian organizations to better understand the challenges they face in providing life-saving and protection assistance and with local authorities, stressing the need to scale up conflict resolution efforts, access to basic social services and protection. “Despite huge challenges – security, access, funding and administrative impediments – they are continuing their critical work and reaching those who most need humanitarian assistance,” she said, praising the work of relief organizations. During a wrap-up press conference in the Malian capital, Bamako, Ms. Mueller said she had been encouraged by the initiatives and the planning being made by the Government, development and aid actors to work together in ensuring that the immediate needs are addressed as well as helping restore and build livelihoods. “This is essential to ensure our work today helps make communities more resilient and better able to survive future crises,” she said. At a time, when the level of need is higher than at any point since the crisis erupted in 2012, the response has been hampered by a severe lack of resources. According to latest figures, only 31 per cent of the $330 million sought by the 2018 Humanitarian Response Plan has been received. 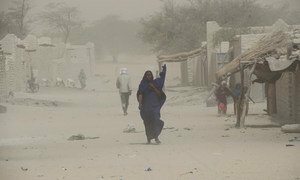 The vast Sahel region of Africa, which is facing multiple threats and challenges – including destructive climate change, drought, terrorism and organized crime – must continue to be a top priority for United Nations peacebuilding efforts, the Security Council heard on Friday.